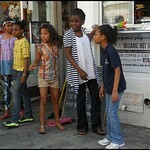 Celebrate Cafe is a social venture business and job training program run through the LES Girls Club. The Cafe is now at 136 Avenue C at 8th Street. Stop by Mon-Sat from 9am-5pm.